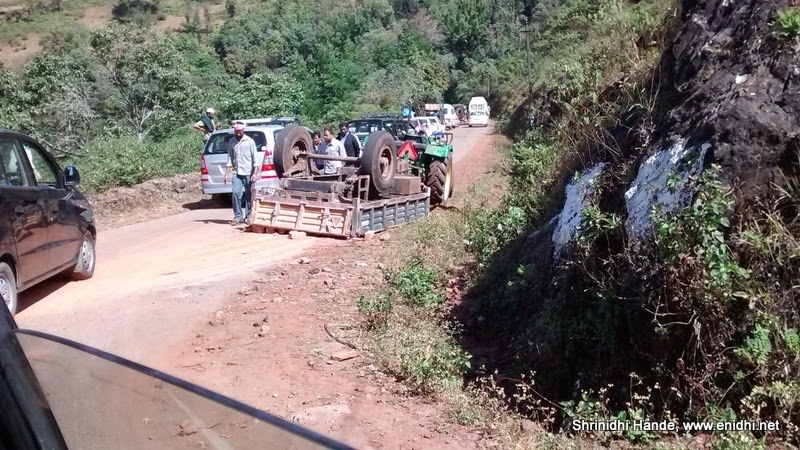 On 26th December, while we were heading for a short tour around Chikmagalur, we spotted 3 accidents/mishaps. This post is a quick brief of those mishaps/accidents, so that we can be more careful in the future. 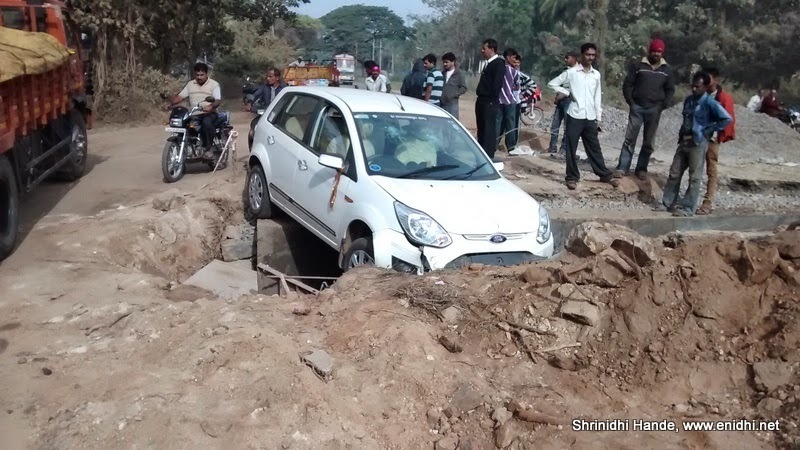 We spotted this between Badravati and Tarikere, a new Ford Figo had got stuck in a middle of the road construction work. Apparently accident happened at 5AM, when visibility was poor due to darkness and fog. The road was cut from left to right and vehicles had to take a diversion by the side. 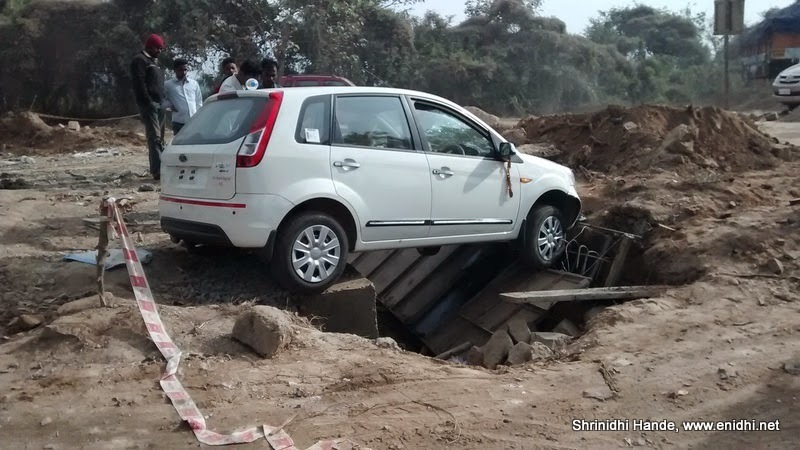 Driver of the Figo wasn’t expecting this and went straight ahead full speed. He had enough speed NOT to go vertically down- car half crossed the dig up and rested on the stone and concrete support. No one was injured, but they had to spend half a day finding help, get a crane or something and get the vehicle pulled out. Do read this post for night driving tips. Accidents like above happen partly because blocked roads are poorly marked in India and those driving at high speed won’t notice them in the last minute and secondly because while driving in the night we should always drive such that we can stop within the visible distance ahead of us. Not following this simple principle can end us in a ditch like above. A turn gone wrong resulted in trailer turning upside down. Hope there were no people in it. For this last one I don’t have any pics. Will try to explain as best as I can. Wish I had a GoPro mounted on the windshield at the time of accident. We were driving down from Bababudangiri in a car, driving through the woods. Suddenly we spotted few bikers heading our way- 2 of them, at a fast pace, without helmet or anything else. They were riding in the middle of the road, one behind the other. Rider in the front spotted the car, moved to left and went past us without any incident, but the rider behind was caught by surprise. He braked abruptly, lost balance and fell down along with his pillion. I braked hard in 2-3 installments and could stop within few meters. But the bike and its riders who had now crashed on the road were still moving towards the car at some speed, due to their momentum before braking. There was a risk that they would come and hit the car, even though car was stationery. I quickly moved back a little to give them more space. Eventually they stopped. The first bike didn’t come back but they had few more friends in other bikes coming from behind- they stopped and helped their friends off the fallen bike. Both riders were luckily alive and didn’t suffer any visible injury, though one guy who was moved aside by his friends was expressing lots of pain. After a brief pause we continued with our journey. Can’t stress more on the importance of helmets and being attentive while driving/riding. If the car in question was the Etios from the pics in the previous post, I'm guessing (from the alloys) that it had ABS. To achieve the shortest stopping distance one would have to press down on the brake pedal as firmly as possible. There is no need to modulate the pressure yourself i.e. brake in installments. That's what the ABS is for. However if the path was slippery and downhill, even with ABS it will take a long time to bring the vehicle to a stop. Better to drive slowly and carefully in such cases. That said, please use the horn liberally in ghats/blind curves. Yes, the car had ABS. First instance I thought I had enough distance to stop. Then I realized bike might continue to move towards me even after the fall, then I had to stop even quicker and move back a little- that was the reason. Our speed was moderate- about 50-60 kmph and road was sort of plain.. but it wasn't very wide.. just wide enough for 2 cars to pass.